Those familiar with Hakka cuisine will know that most of the dishes are meat, salt and grease heavy- a fab combination if you want to clog up your arteries. That said, some of the famous dishes are deliciously addictive when done well, especially the sliced belly pork with mustard greens and the salt baked chicken. I’d been hearing, “Hakka Ye Ye this.. Hakka Ye Ye that…” for a while, so when I finally got round to going, my curiosity was piqued. I didn’t even realise it was on Wyndham Street..all that time spent walking past the building towards drinks and I hadn’t noticed. But then again, how many people walk around looking at what interesting shops/restaurants exist on higher floors? We should do it more often, heaven knows how many exciting establishments are waiting to be discovered! On second thoughts, HK’ers strolling in the streets with their heads perpetually tilted upwards would be a gazillion accidents waiting to happen. 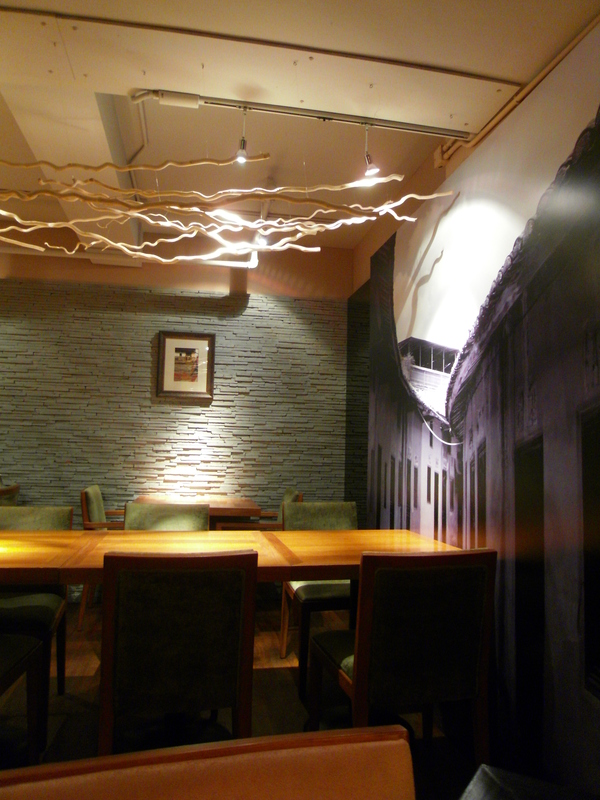 I digress.. first impressions of Hakka Ye Ye- cosy and compact restaurant. Not so cosy when you feel the full force of the air-con though. As there were only two of us eating, we tried not to go crazy on the ordering. 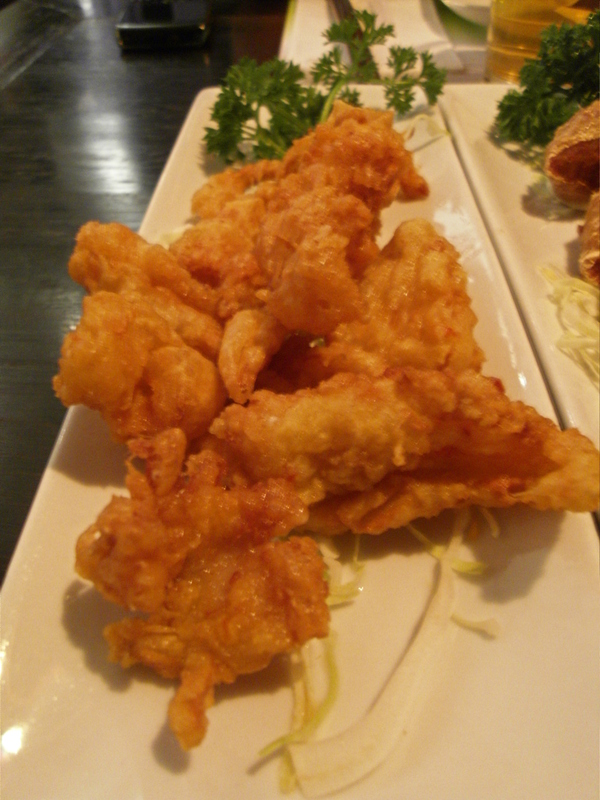 But, wanting to try a variety of dishes, we selected the crispy pork nuggets and salt & pepper deep fried squid to start. For mains we ordered the belly pork with preserved vegetables, the steamed egg (with salt egg and preserved egg) with minced pork and the Ye Ye fried white, red and brown rice with Chinese bacon cubes and vegetables. 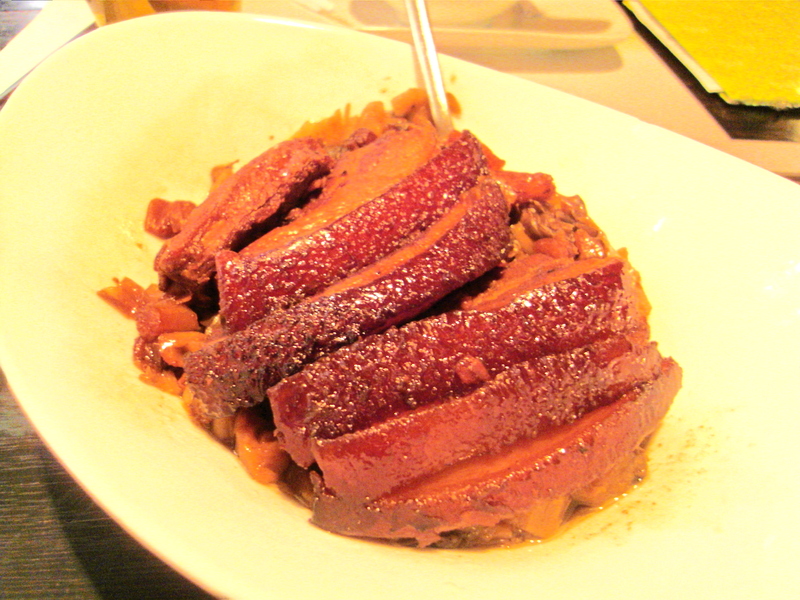 The salt and pepper squid was average and not any better than any other Cantonese dai pai dong that serves this dish. 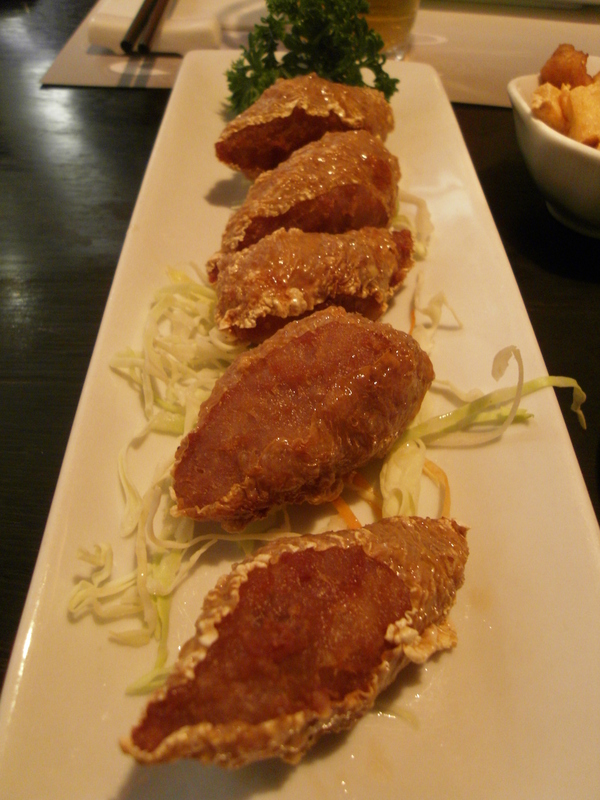 JL commented that the crispy pork nuggets were, “a nicer version of McDonald’s nuggets”! The braised belly pork was standard, nothing to rave about but a good introduction to the dish if you haven’t had it before. Not that I recommend you eat the fat, but in this case, the belly pork wasn’t very fat or succulent and the preserved vegetables were over stewed. 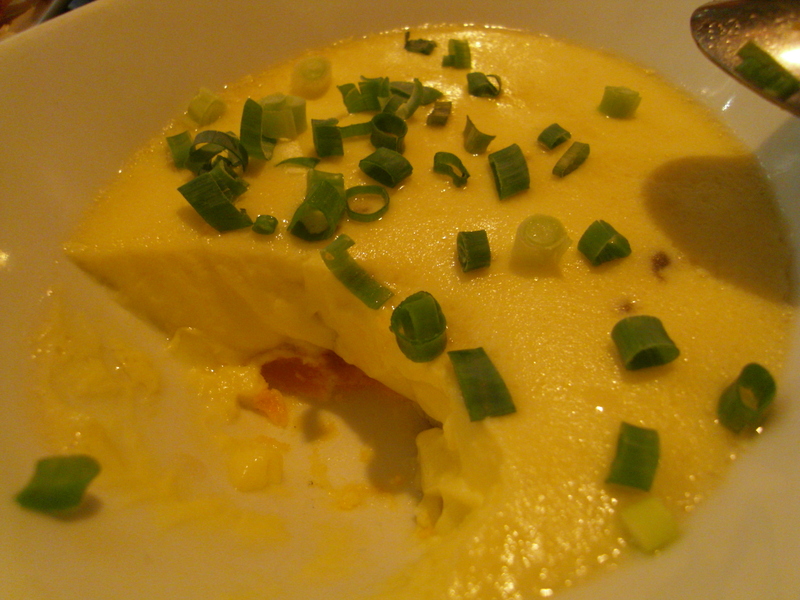 The only notable dish was the steamed egg. Beautifully smooth with gorgeous mouthfuls of salt egg yolk. Both of us were floored by the huge bowl of Ye Ye fried rice but it went well with all our dishes. If you’re stumped for dinner ideas, then give Hakka Ye Ye a go. But honestly, I’m stuck for flattering adjectives and all I can say is.. it’s OK. Categories: Hakka | Tags: belly pork, brown rice, Central, Hakka cuisine, Hakka Ye Ye, Hong Kong, red rice, salt and pepper squid, steamed egg, Wyndham Street | Permalink.